Tinted moisturizer is foundation's sleek and sophisticated cousin. Instead of full coverage, it provides a sheer finish but has the added benefit of extra hydration. 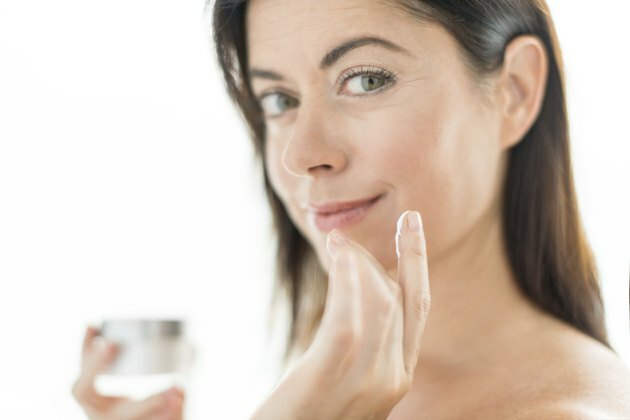 For those with mature skin, tinted moisturizer is an especially attractive alternative to traditional types of foundation, which tend to highlight -- rather than conceal -- wrinkles. Look for tinted moisturizers that contain anti-aging and restorative ingredients. If you don't have a separate sunscreen to wear in addition to makeup, choose a tinted moisturizer with SPF as well. Tinted moisturizer may be light, but it can still deliver heavy doses of hydration to dry, mature skin. Look for a product that contains powerful moisturizing ingredients like glycerin or hyaluronic acid. Natural emollients like shea butter and coconut oil can also be soothing to very dry skin, and are contained in products like Bobbi Brown Extra SPF 25 Tinted Moisturizing Balm, which is recommended by "Real Simple" magazine as a powerful hydrating product. Peptides are proteins that promote the growth of collagen and fight wrinkles, and lend added benefit to any tinted moisturizer. Revision Skincare Intellishade SPF 45 Tinted Moisturizer combines extra sun protection with a peptide-packed formula to help reduce the signs of aging while preventing further sun damage, as noted in a review by "Allure" magazine. It makes an ideal choice for those with a lighter skin tone and previously sun-damaged skin. Vitamins and antioxidants are essential for mature skin, as they can help neutralize harmful compounds from lifelong sun exposure and other environmental damage. They also promote cell growth and repair, contributing to a lasting, healthy glow. Named among "Elle" magazine's 13 Best Tinted Moisturizers," Le Metier de Beaute is one such product packed with vitamins A, C and E to deliver restorative effects. Retinol is another weapon in the anti-aging arsenal that can repair cellular damage and boost the growth of blood vessels, as well as minimize wrinkles. Applying retinol under the eyes can also help to minimize fine lines and sagging skin. According to Glamour.com, a reliable tinted moisturizer containing retinol is Neutrogena Healthy Skin Enhanced Tinted Moisturizer (SPF 20), which comes in a wide range of colors and evenly conceals blemishes and sunspots. Glamour: This Do-It-All Skin Care Product Is a Glamour Reader Favorite, and Now I'm Obsessed Too!